Dictionary.com definitions and two things Batman does not like. I was roughly ten years old when I was first truly exposed to the caped crusader, and it was on film. I'd seen some of the classic TV show and watched a few cartoons, but none of that had made much of an impression on me. It was only when my babysitter had rented a VHS copy of Batman (1989) and allowed me to watch with him that I became hooked. It was Tim Burton's shadowy and gothic realisation of the Batman concept that imprinted itself in my mind, I found it totally enthralling as well as pretty scary and ever since have searched for something to equal this first experience. My search took me from cinema screen to TV screen to the pages of DC comic books and full circle back to the cinema again, and on this search there have been exhilarating highs, like the fantastic Knightfall comic storyline, and upsetting lows, mostly down to a certain Schumacher, and I write not of the racing driver! I was pretty happy with Christopher Nolan's Batman debut in Batman Begins (2005) but it played safe and delivered a passable origin story with all the 'oohs' and 'aahs' of a comic adaptation and a blockbuster but without the heart and intelligence of the true classic I was hoping for. Bruce Wayne came of age in Batman Begins but the villains were second-rate an the plot was ill conceived – a kung fu film at the start becomes a crime thriller with a stodgy mobster that incorporates a mediocre villain and concludes thematically where it started with a sensei-gone-bad, can-the-pupil-beat-the-master ending. Now, leaving out Heath Ledgers tragic death for the moment, press hype has suggested The Dark Knight may be somewhat more than its predecessor in scope and performance. Ever cynical of all the hearsay and cautious that my Batman standards may be a little too high even for this expected masterpiece, I pretended to not be a touch apprehensive as I settled down for the two and a half our feature. What I had witnessed when I eventually vacated that seat was an exercise in reinventing a classic franchise akin to James Bonds in 2006's Casino Royale. I write not specifically of the Batman/Bruce Wayne character but from the way in which each character is given equal attention, to the nature of the script structure and Nolan's mature, serious handling of the story. This, unlike so many comic book movies that now saturate the Hollywood market, is not flippant, garish or showy, but instead has gravity, intelligence and substance. Much has been said of The Dark Knight being the Heat (1995) of comic book films, and there is certainly something in that statement. There is a sophisticated crime genre plot weaved around well drawn and excellently acted characters, with the ultimate central focus being two figures of opposing morality, so one can be forgiven in making Michael Mann comparisons. What stands out to me in this film more than any other of the 'superhero' genre is how the defining comic looking appearances of the key characters (the batsuit, the Joker's make-up etc.) is assimilated so much in the completeness and believability of Nolan's second Gotham City world that you no longer notice. The Joker never looks ridiculous or silly and Wayne and Batman are played so differently they are, as they should be, noticeably different characters. Performance wise this film is marvellous. It would be wrong of me to discuss 'supporting roles', as all of the main characters are afforded so much attention and developmental respect, with them all central in some way to the themes and ideas of the script, that it is just a small way off an ensemble piece. Gary Oldman brings Gordon's character to life much more vividly and heartrendingly than he had the opportunity to in the first film, Maggie Gyllenhaal more than competently reprises Katie Holmes' Rachel Dawes and Aaron Eckhart is solidly brilliant as the tragic character of Harvey Dent. On the periphery, Wayne's aids Lucius Fox (Morgan Freeman) and Michael Caine's Alfred are the pillars of strength every hero needs at their foundation. And yes, Heath Ledger is as good as everyone hoped as the Joker. There is something eerie about watching the recently deceased onscreen, but it is nothing less than heartbreaking when it is one so young and so talented. 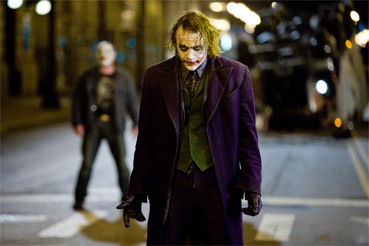 This would be a good film without the Joker, but with him, with Ledger as him, it is a brilliant film. What he did with probably the best known comic book villain ever was not short of amazing. I always liked Jack Nicholson's version of the Clown Prince of Crime, it had the dark theatrics one expects from the conventional imagining of the character, but what Ledger does with it is exactly why the whole film works so well, he brings believability to the Joker, and that is a truly frightening thing. When viewing Ledger's Joker you are not looking at a clichéd villain, you are looking at an insane man driven to total nihilistic anarchy, a man who wants to bring the world to his knees just because he can. You are looking at a Joker whose name is bitterly and terribly ironic; "Why so serious?" he hisses before ripping through the cheek of a mobster. You are also witnessing a man who will sadly enter the canon of youthful and talented dead. We all mourn his loss. It is hard with such a figure as his nemesis for Christian Bale to stand his ground, but he manages it, all be it with the helping hand of some great set-piece action sequences and some brilliant new gadgets. I still see Bale's Wayne as a slightly hollow man, without the undertones of darkness Keaton had that are required to propel him into the Batman crusade. Bruce Wayne is a complex character who I think has never been done total justice in film interpretations. But as Batman Bale has the most formidable presence, aided by a digitally lowered growling voice that on occasion seems a little over the top. These are small criticisms though and the final exchange between Batman and Gordon is cinema gold. Does this surpass my lofty childhood experience of the first Batman movie? No, but it might just equal it! What Christopher Nolan and brother Jonathan have created is not an adaptation of known characters but a reinvention. If there is to be a third installment of Nolan's Gotham they will have to make something very special to surpass The Dark Knight.